If you’ve been my friend, you would know how much I anticipated to have this book in my arms and kiss the hell out of it. I’ve been there waiting the entire year just to have a touch at this book. I’m pretty sure at some points my friends got annoyed at me for my constant sighing and whining because I’m not that good that waiting. But all those months of waiting finally paid off because HOW IN THE WORLD DID COHO MANAGE TO WRITE THIS ENTIRE PLOT?1!?!?1?1!!!!! Ben the Writer meets Fallon the Transient in a restaurant in LA on November 9th when they are both 18. Fallon is an ex-teenage actress whose career died the moment she had scars marking half of her face and body due to some accident when she was 16. After realizing that they both have intense attraction and palpable chemistry going on—but couldn’t be a couple due to wrong timing, they later make a pact to meet each other on November 9 every year at the same place and same time without any form of communication in between. And now we have a story to unfold. "Did you just say sigh? out loud? Instead of actually sighing? The premise of spending only 1 day each year with a stranger you barely know is unrealistic, but isn’t that romantic? LOL. Damn it if I say I don’t wish for a set up like this with someone as attractive as Ben. To put your trust in someone to come see you even after a whole year of not talking and hoping that they wont disappoint you is bewildering and exciting. And in those 1 year, anything can happen. CoHo proves that statement with this book. This book doesn’t grip me as much as it grips others. Not until somewhere in the middle of the book. The first few chapters are cringe-worthy. I went all wtf at Ben for his cheesy lines and then at some cheesy moments here and there. I dislike some parts of the early chapters. I think this is why I cant give it a full on 5 stars. Not until the third November 9 that I started to feel things. And boy, the roller coaster ride I went through last night? Its worth it. The hours I spent not sleeping is worth it. Moving on to the 4 best things I like about this book. 1) Ben the Writer is not much of a reader despite being an aspiring author. He reads but not as much as Fallon does. That girl is a huge sucker for the romance genre and being me, I got super ecstatic!!!!! There are a few mentions on the typical plot of a romance novel that I’m so familiar with and those tiny little details (alpha-male, book-worthy kiss, grand gestures) thrown in between the pages of November 9 and I couldn’t love it more. Also, there’s the whole talk about TBR piles and insta-love and whatnots. 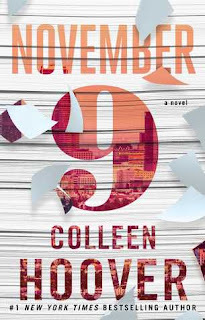 2) Naturally, being a romance novel itself, November 9 also has its own grand gesture. That mega thing one of the characters did to fix their relationship. And THAT grand gesture in the book? THAT MIGHTVE BEEN THE BEST GESTURE IVE EVER READ. And the most tragic and saddening gesture all at once. 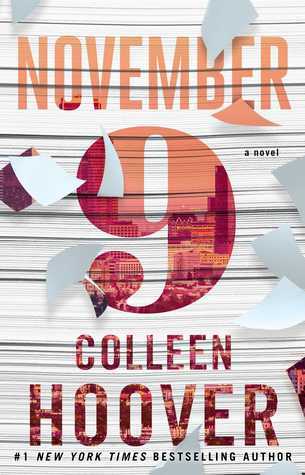 3) When you talk/discuss about November 9 with fellow readers who also have read the book, there's one huge thing to talk about. The plot twists. THE MINDBLOWING PLOT TWISTS. THE ‘HOW COULD YOU WRITE SUCH HEARTBREAKING PLOT TWISTS, YOU CRUEL AUTHOR?!!!! DO YOU NOT HAVE HEART?!!1?1?! !’ PLOT TWISTS. Notice that s there? Yep. You're gonna have to face quite a few numbers of plot twists. Be warned, people. In all honestly, I can sense something bad and heartbreaking is coming due to the response I got from my friends. So when I read the book, I was on high alert the whole time. I didn’t let myself grow attached to the characters too much. I kept on imagining the worst possible scenario and came up with a few theories (I got one of my theories right). I texted my friend Kimberly at 2am—telling her my theories and predicted whats gonna happen next and being a good friend that she is, she went all, “LOL that’s funny but yeah it could happen”. But nothing my mind plotted could come close to the actual plot twists. NOTHING. 4) Ben's family. Or Ben's brothers to be exact. OH OH AND MILES AND TATE ARE FEATURED IN THE BOOK YESSSSSSSS!!!! I SAW YOUR INSTA POST. AND I AM GETTING NOVEMBER 9. TODAY. I just started reading it. And I always get attached to the characters? Can someone please tell me if this book has a happy ending or not? And please say that no one dies..